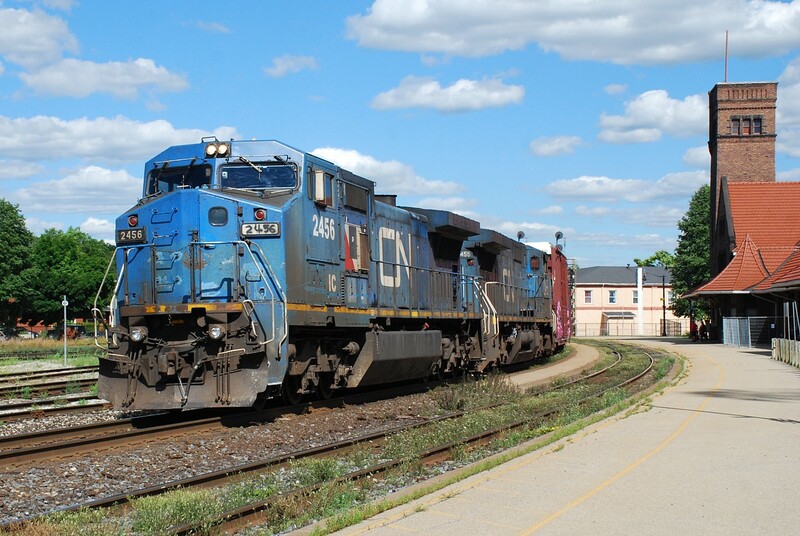 Railpictures.ca - Rob Smith Photo: CN 435 slows to work the yard in Brantford with a pair of ex. LMSX C40-8Ws leading. When I first saw it rounding the curve it almost looked like a very late NS 327 approaching with a Conrail leading. One can dream. Instead we have these “beauties”… | Railpictures.ca – Canadian Railway Photography – photographie ferroviaire Canadienne. Are sure in this day and age, waste is not contained within until the car is serviced??? That’s just from people flushing the toilet on VIA trains while they’re at the station. The north track and the rest of the south track is in tip-top shape… You just couldn’t resist could ya Snake? Hey look at all those weeds…Hmmm Mr Hall.. Perfect shot, Rob. Perfect day, too. An even better angle of that beauty number board. A super photo of these 2, nice focus and exposure.